Videogames do a lot of leg work for the player in terms of sensory representation. As a kind of composite uber-medium that encompasses audio, visual, textual, and systemic content; all in digital form, it leaves very little space for the player to fill. Role play is often a major part of the immersive quality of games, and while each medium has found its niche for the audience games often excel when they put players in the procedural space. What I mean by this is that the interactivity, the procedures the player enacts, is the missing part of the game that player fills. This means that role play is decision (or choice) based, rather than imagination based. The player does not need to imagine visual locations or characters, or gaps in time due to editing, only potential outcomes of decisions. Being involved in the Spy Party beta has been interesting in that, as a game in the process of being built, there are atmospheric elements still missing, even though the systemic content is already quite advanced. Music, for example, is missing. Only background party chatter and the clinking of drinks is heard. It has made me realise just how much of a difference can be made to a player's experience of entirely the same systems when manipulated whilst listening to music. As a result, my Spy Party sessions have been accompanied by a soundtrack of my devising, namely Chris Potter’s live sessions on shuffle. This addition has done wonders to enhance my role playing as both the spy character and the sniper. 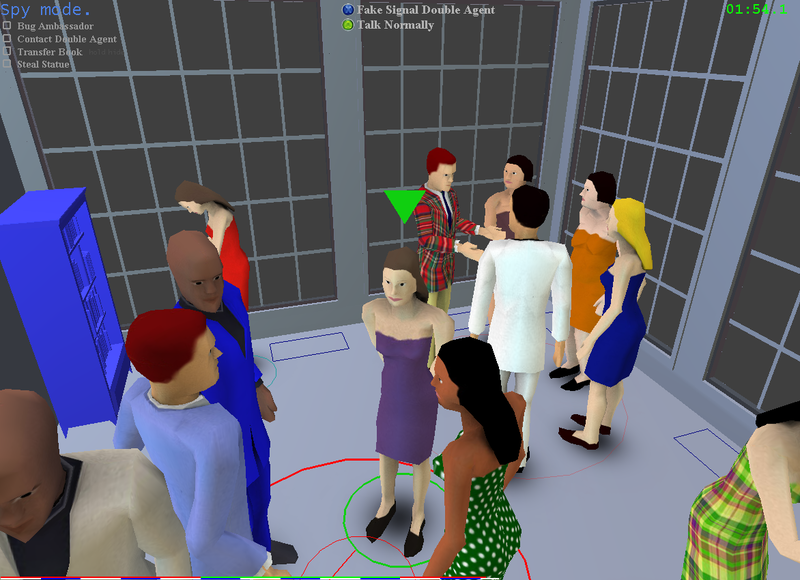 Many elements of Spy Party's gameplay are timing based, while the rest are behavioural based. All of them are skill based, as designer Chris Hecker has emphasised. This jazz accompaniment has altered my approach to this timing by tweaking the tempo at which I play the game, as the rhythm of the music evolves I found myself developing a narrative that matched. Sometimes the sniper's laser would hover over me during a particularly syncopated section causing added tension as I strove to remain undetected. Or I would smoothly take control of my character as the brush strikes on the snare laid out a sophisticated beat, creating that ultra-cool presence of the super spy. You may have noticed all of this applies to the spy role. I have yet to find a genre of music that matches the equally engaging sniper gameplay in quite the same way, something classical perhaps? Or some tech metal to match his/her constant and ever roaming alertness? Suggestions welcome. Posted in "Chris Hecker", "spy party"